Today, choosing the right methods for reaching strategic prospects and customers can be overwhelming for businesses. Websites, email, direct mail, mobile, social, webinars, blogs, print ads, direct mail, PR and trade shows are just a few. Problem is, what works today might not work tomorrow. Customers change. Their needs change. How you reach them, and how they prefer you reach them can change. Choosing the wrong vehicles to reach customers is a frustrating and expensive experience we help clients avoid. We help clients make sense of their marketing options and choose tactics most suitable to their goals and budget. And we can create and manage customized marketing programs based on the life cycle of their strategic customers—from pre-sales, to sales, to loyalty communications. We identify how to get more qualified strategic customer leads, and what to do with those leads when they happen. ClearBrands knows that even a great company with a great product won’t get far without a regular flow of great customers. That is why a remarkable portion of our business is devoted to building engines that keep your prospect pipeline filled. Identify your best prospects, introduce them to your single nail, and set appointments for your sales team in a planned, sustainable way with a regular program. Control of this pipeline helps you avoid the feast-or-famine highs and lows that occur with uncoordinated sales and marketing. We closely track, measure and report plan performance for continuous improvement. We build high-value pipelines using our time-tested B2B development process. 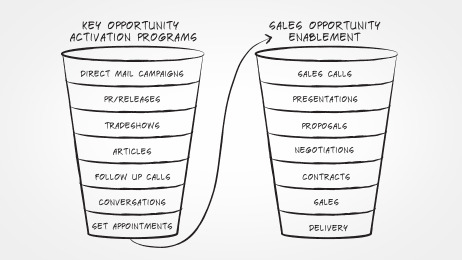 We work as an extension of your sales and marketing team ensuring communication, accountability and optimal outcomes. ClearBrands Strategic Lead Generation gives our clients the capability and flexibility to automate demand campaigns, delivering more strategic customer leads with less effort. Our ability to work collaboratively with internal and external sales and marketing teams ensures the programs we recommend are more likely to be adopted and utilized as intended.